Hi. My name's moquot_ee6_3_3. It's hard to pronounce, though, so just call me Moq. Most everyone does. I'm a Bori, and I love Terror Mountain. It's one of my favorite places to visit. Ice, snow, delicious food... It's really loads of fun. However, like most places in Neopia, if you're not prepared, a trip up Terror Mountain can become unpleasant. In order to prevent that from happening, I'm going to give you some tips to make sure you enjoy your trip. First of all, and the most important thing, is that you keep an eye on your pets. 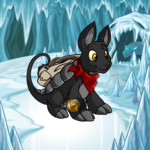 I know it seems odd, but if you've got a pet painted White or Ice, they just might blend into the surroundings and get lost somewhere on Terror Mountain. If your pet is a bright, flashy color like Disco, this is easy; otherwise, you might consider making your pets wear brightly colored jackets. Speaking of jackets, you should probably have those anyway. It gets pretty cold up there. Scarves and hats are also highly recommended. Before you head out, you should also check the weather. Marching around Terror Mountain in the middle of a blizzard can be tiring and not all that fun. If the weather looks like it'll be bright and clear, great! If it looks like a storm is coming, you may want to consider postponing your trip for another day. Go somewhere nicer instead. Mystery Island tends to have pleasant weather. However, I'm going to save the talk about Mystery Island for another day. Let's get back to Terror Mountain. By the way, there's always the chance the weather might change, so even if it looks like it'll be a good day, keep an eye out once you reach Terror Mountain. If it starts getting dark and cloudy, you should probably go and find shelter. The Snow Faerie is very kind, if you need a place to stay until the weather clears up. As a bonus, she's great to talk to. Think you're ready yet? You aren't. You need to pack some supplies. Food is a very nice thing to have when you're traveling around. Personally, I try and pack some chocolate whenever I head up the mountain. It doesn't melt so quick in the cold, so my paws don't get all covered in goop when I'm trying to eat it. Monkeytastic says I'll get sick if I eat nothing but chocolate, though, so she makes me pack other things. Soup's pretty good if you can get it to stay warm. Another option, if you aren't willing to bring along a pack full of food, is to bring along some neopoints and make a note of the location of the Super Happy Icy Fun Snow Shop or the Slushie Shop. You can always get something to eat there. You should also pack a few things in case you get stuck or lost up there. Terror Mountain's a big place, and it can be easy to lose track of where you're going. I'd recommend bringing along a map, and perhaps packing a few extra pieces of warm clothing, in case your pets start getting too cold. Wood for making a fire is pretty useful, as are weapons. Yes, weapons. I've never had it happen to me, but this Usul I know swears she once got chased across the mountain by the Snow Beast, so I don't think it would hurt to be ready to defend yourself, just in case. So now that you're all prepared, you might be wondering, is it really worth all that preparation to go Terror Mountain? I think it is. There's so much to do, and I'm just going to tell you a few of my favorite things to do and places to visit. I think I'd have to write a whole lot more to tell you about every single thing I like to do. One place I really love is Wintery Petpets. It's always fun to visit and see all the adorable petpets they've got there, even though Monkeytastic won't get me one cause I've already got a petpet and two's too much for me to handle. Not that I don't already think my petpet is great, of course. Another place I like to visit is the Shop of Mystery. It's run by an Ixi called Tarla, but lately she's been on vacation and showing up all over Neopia. Or at least, that's what I heard. I hear people saying she showed up, and by the time I get there, she's already gone. Oh well. When she's at her shop, though, she sells these fun bags, and you never know what's inside them. The surprise is the best part. If you're going up to Terror Mountain, you should visit the Snow Faerie, definitely. She's super nice, and she lets you help her with finding some things so she can work on her magic. She's up near the very top of the mountain, though, so it can be a tough trek to make. Some days I try and go up there and I'm just too tired to make the trip all the way up. When I'm not eating the food that I bring with me, I like to visit the Slushie Shop. Slushies are delicious, and come in all sorts of flavors. I especially love the fruit flavored ones. Monkeytastic never lets me get too many at once, though. She says I'll spoil my appetite. If you like risk and excitement, the Snowager's cavern is always an option. The Snowager lives in the Ice Caves and protects this giant hoard of treasure. I know of some Neopets who managed to sneak in there while he was asleep and grab some cool treasure, but I never manage to get anything for myself. By the way, if you do plan on sneaking some treasure, you should bring a few Healing Potions along, in case you have my kind of luck and he tries to blast your pets. So that's it. Terror Mountain can be a cold place where, if you're not prepared, you won't have as much fun if you should. But as long you make sure you're ready for any issues that might pop up and plan ahead, it's more likely to be a place full of fun and excitement. Hope to see you there! 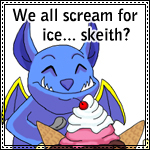 We All Scream For Ice... Skeith?